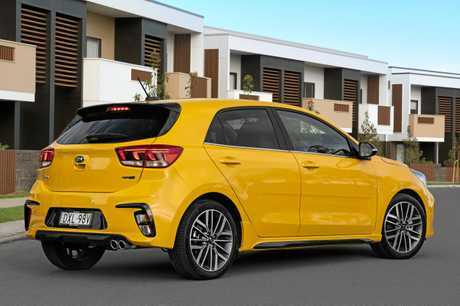 THIS is the car Kia should have launched when the Rio first landed two years ago. 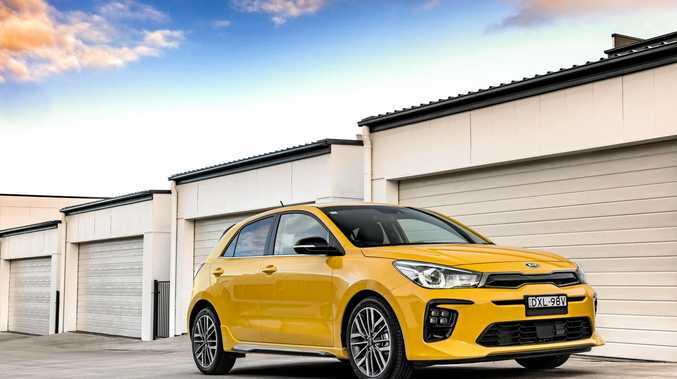 Now king among the Rio clan is the GT-Line, which has a three-cylinder turbo beating within its compact dimensions. This is the engine it was showcased with at its Paris reveal in 2016, but international pressures and right-hand drive availability has only just seen its arrival. Priced at $21,990 drive-away, that makes it a $4400 leap from the base model S.
Ample bang for buck is offered, with a colour seven-inch touchscreen, six-speaker stereo with Android Auto and Apple CarPlay, carbon fibre-look dash, along with sports pedals and steering wheel. Externally the hatch exudes European influence, accentuated by a body kit, twin exhaust and 17-inch alloys. It only has manual aircon, and the GT-Line doesn't have as many colour choices as other models - only available in white, silver, black, red and yellow (blue and graphite are not included). Base model Rios come with six airbags, anti-lock brakes and stability control, but the GT-Line gains autonomous emergency braking with forward collision warning, lane keeping assist, LED daytime running lights, rear parking sensors and driver attention alert. Despite the tech, no radar cruise control. 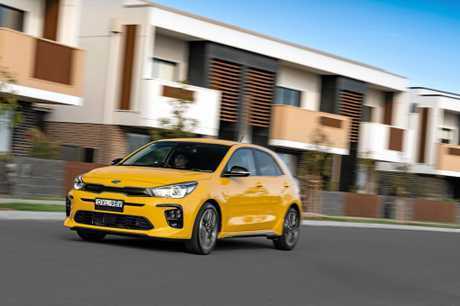 Gaining 5mm in length is purely in the body kit, and the Rio remains a compact runabout. 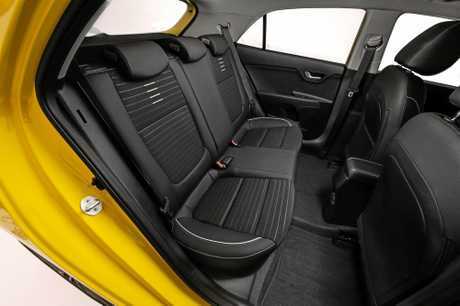 Rear legroom is dependent on the generosity of those seated up front, but four adults can be carried without too much compromise. Operationally everything is straight forward, including just a single dial for the aircon, while the touchscreen is easy to navigate and made easier by using the smartphone mirroring applications. There are dual cup holders in the console and the doors can also handle bottles, while there is a USB port in the front and another in the rear. While small, the little triple has some oomph. From standstill it's happy to rev and get away from the lights with vigour. Generating 88kW and 172Nm, that's an extra 14kW and 39Nm over the standard petrol, it feels perky and more responsive. Sitting on about 2300rpm at 110km/h, it doesn't feel like a micro machine on the highway. With bigger front brakes than its siblings the GT-Line feels more dynamic than other Rios - which have been improved recently with a more modern six-speed auto replacing the ageing four-ratio unit. During our tenure it returned fuel consumption of 6.7 litres for every 100km. The boot space is surprisingly good for its size. An adept performer, this derivative is powered by a 82kW/160Nm 1.0-litre turbo 3-cyl. Fun city car with impressive dynamics and a solid specification list. The three-year warranty is extended to five years with dealer servicing. The benchmark of the tidler class, this derivative also runs a 1.0-litre turbo 3cyl generating 85kW/200Nm with a 7sp dual clutch auto. 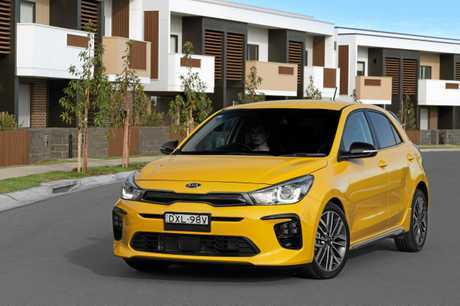 Doesn't have the sporty good looks of the Kia, but it's a better drive and comes with an eight-inch infotainmment system. Falls short on warranty, but it is five years and unlimited kilometres. An underrated offering, it uses superseded VW Polo architecture and 81kW/200Nm 1.0-litre turbo 3-cyl/seven-speed auto. Smart packaging like all Skodas, and responsive performer. 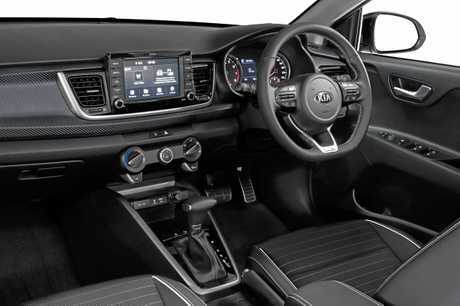 Kia answered the key criticisms of its Rio with the latest mechanical updates. Despite the price it doesn't feel inside like a massive jump in luxury over the S model inside, but the reward comes from punchier right-foot performance. WARRANTY/SERVICING Seven-year unlimited km warranty, capped servicing $2027 for five years with intervals every year or 10,000km. ENGINE 1.0-litre 88kW/172Nm 3-cylinder, seven-speed auto. CARGO 325 litres, 980 rear seats folded.